What could be the most annoying part of fishing is having to constantly tie knots. You just re-spooled your reel so now you have to tie on your favorite lure. Your line broke and now you need to tie another hook on for the fifth time that day. Or maybe you need to change your leader line and need to tie on a new one? Whatever the reason, anglers always end up tying lines. Could there be something to make the process easier while still maintaining the strength of those knots? That’s where the Tauten LineWelder enters the picture. I was able to get my hands on one of them and can tell you that I love it. Keep reading to learn more about the Tauten LineWelder and see if it’s right for you! The package I received was the LineWelder system along with two attachments. We’ll go over the attachments later, but let me first talk about the system. 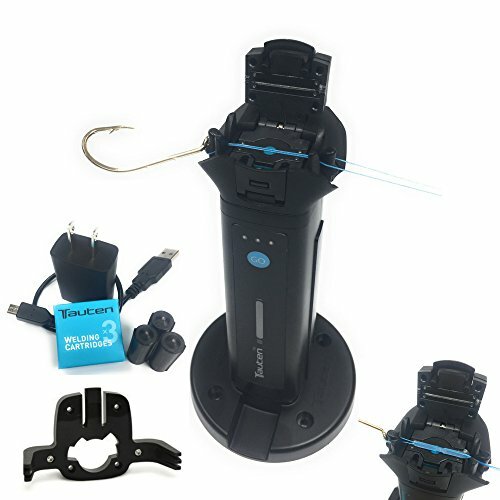 When you open the box you’ll find a bevy of items: the controller, the welding head, micro usb cable, usb power plug, a pack of three welding cartridges, and monoweld fishing line. This is more than what you need to start welding your line. This is the brains of the operation, so to speak. The entire package weighs about 5.3 ounces, so definitely light enough to carry around with you as you fish the banks of your favorite river or stream. Ergonomically designed to comfortably fit in your hand as you secure your line and activate the welding process. Beyond that, it’s super simple to use. When you’re ready to start welding, press the blue GO button on the controller to get the process going. Three LED indicators display at what point the process is in and when it’s complete. Additionally you can use the LED’s to troubleshoot any kind of error if one were to occur. In my testing everything worked perfectly and functioned as necessary. Interestingly, when I first tried to use the device I did not include the cartridge. When I pressed the GO button I noticed the weld plunger thrust up in the controller. Clearly this was not intended so a quick read of the instructions pointed me in the right direction. Super easy to follow, I was able to get myself out of that jam and install the cartridge correctly to start welding. The Welding Head is the part of the package where all the magic happens. I found its construction to be high quality with nicely finished parts and all the hinges worked without restraint. Even without consulting the instruction manual you should be able to figure out what to do when you attach the welding head to the unit. That’s a testament to the engineering of the device. When I attached the head unit to the controller I found what looked like a trap door revealing the compartment to load the welding cartridge. You’ll see below a shot of the cartridge installed. Loading the cartridge was a cinch. A small clip opened up a front facing door that exposed the lip of the welding head. When you pull that part up you’ll see the blue circular gasket and the container where the cartridge goes. You simply load the cartridge, pointed end up and close the lid down onto it and snap the front facing door to secure it in place. As pictured below, you’ll see the welding head ready for your line. Tauten LineWelder – Welding Head loaded and ready to weld! Once I installed the cartridge and snapped everything back into place, which was really straightforward and easy to do, I was ready for my first weld! Each cartridge is listed to be good for about 12 welds so it’s important that the process to replace them is easy, especially in a moving environment like on a boat. I found the entire process very easy and would be comfortable having to do this on a charter or a boat on big water. I didn’t find myself fumbling with anything throughout the installation process. When you buy the Tauten LineWelder, you’re sent a box of 3 welding cartridges to start. Each cartridge will last you approximately 12 welds. When I tested I ran through a cartridge with 13 welds. But if you are to go by the approximate number, you can expect 36 welds per box. As mentioned before, installation is easy and replacement is easy as well. A great thing about the LineWelder controller is right below the GO button is an analog indicator that tells you precisely how much welding material is left in your cartridge. When the line is at the bottom of the indicator that tells you the cartridge is full. Once the lines reaches the top, you’ll need to replace the cartridge. Additionally, one of the LED’s will blink red to also acknowledge the need to replace a cartridge. In other words, you’ll never have to guess how much welding material you have left before replacing a cartridge. A full charge of the battery should yield over 150 welds. The USB cable isn’t very long which could be inconvenient if you don’t have a plug close to a surface, but beyond that it’s a standard plug and cable. You can disconnect the cable from the power plug if you have a USB dongle located somewhere on your boat that produces power. From inspection, both the cable and power plug look to be of good quality and should hold up with regular, normal use. When plugged into the wall, the battery should charge fully from 3-4 hours of charging. When plugged in to a USB port on a PC, expect the battery to charge after 6-8 hours of charging. Also included in the package was a small spool of Monofilament Trilene line, called MonoWeld. The monofilament line was rated for 17-lb weld strength, or 14-lb knot strength. It has a diameter of .013″ and provided was about 100 yards, more than enough to set up as a good leader several times over. When testing monofilaments I used this line exclusively, but as Tauten has indicated on their website pretty much any monofilament will work, provided it’s less than the .014 diameter of heavier monofilament lines. I’ll go into this in more detail later, but with the package you get a solid option for leader line that is proven to work well with the LineWelder. It’s a good choice and it’s free which you can’t really go wrong with! When I got my hands on this device, I set out to determine three things. One, can the welds really hold up to the weight as advertised? Two, is it faster or slower than hand tying the typical favorite knots of anglers? Three, is the machine more or less convenient than traditional hand tying? Is it worth having a device do the work versus doing it by hand? With these objectives in mind, I performed a series of tests to see just how good the Tauten LineWelder is. Besides seeing how quickly the LineWelder can weld against a traditional knot, the most important test I conducted was just how strong the weld is. For this test, I did not have a system of pulleys or a machine to properly test knots. Instead, what I did was I took a strand of the monoweld fishing line, rated for 17 lb test strength, and added a weld to either side of it. I made the loops large enough to put a pen through each loop. Then, I pulled the pens apart until either the line gave way or the weld. I did this two times. On the first try, as I was welding, I noticed one loop was not properly set into the LineWelder creating an uneven weld. When you’re welding your line, there are very easy to see guides that naturally place your lines in the optimal position for welding. It’s important to use those guides to consistently have strong welds. In this case, I had both the tag end and the other end of the line pulled down to one side of the guide. This caused the line to bunch up and be welded to a corner of the actual weld. When I pulled the two welds apart, that bad weld broke off after some considerable pressure applied. I noted this because I wanted to show how important it is to lay the line in the device correctly. My next test I took another strand of line and repeated the loops, but I made sure to do both correctly. Again, I pulled the welds apart and this time the line broke rather than compromising the welds. This test proved to me that I can be reasonably confident the welds will hold when fighting a fish, provided the line is set in the guides properly. In my test I created larger loops but in the case of actually welding your line around a lure or hook, you would not need excess on one side of the guide so you can expect a nice, clean weld every time. One of the reasons anglers would choose a LineWelder over tying their own knots would be speed. I know in my experience, if I have to change or lure or I broke off, I want to be done as quickly as possible. Rather easy except when you’re in the elements, or on a boat swaying in the current, or you’re just having a hard time seeing the line. That’s part of the reason why swivels have been so successful. Anglers want efficiency and tying knots isn’t always the most efficient way to get your lures on the line. I took this opportunity with the LineWelder to see just how fast the welding process is against a few of the more popular knots. Firstly, I ran a weld on a spoon that I used as my test lure. The LineWelder site states on their FAQ that a weld is done in approximately 35 seconds. I found that to be a little too quick, as the test device I used finished a weld at 41.74 seconds. Not too far off from their numbers but I started my timer from the moment I pressed the button until the indicator blinked the welding was complete. I suspect the discrepancy is largely due to not having a fully charged battery when I ran the test. For the knots, I went to Berkleys’ website and tried several from their knot page. When I timed my weld, I figured I most certainly would have no problems beating its time with my favorite knot, or most other knots for that matter. Sitting there watching and waiting for the weld to complete seems like an eternity. But, as I went through knot after knot, try after try, I found myself more appreciative of the speed and convenience of the LineWelder. The only knot that I could tie faster than the LineWelder could weld was the Berkley Braid Knot. Honestly I think it was an accident I was able to get it tied so quickly. One downside to the knot however is that you’re clipping more line than a traditional knot. If you check out the video linked to the name of the knot, you’ll see the tag end and the loop end both have to be cut to keep the knot clean. Not the most efficient way to use line. Other than the Berkley knot, every other knot I tried, including knots that I’ve tied for my entire life, took longer than the LineWelder. And again, these are under absolutely calm, normal conditions. I wasn’t even outside. Add the elements and potentially being unstable in a rocking boat, I can’t imagine my times would improve. Seasoned anglers may find better times if they really tie knots regularly each and every outing, but I can’t believe they’d be significantly improved over my times. I’d absolutely say the LineWelder is far more convenient to use than having to rely on hand tying your lines. There are drawbacks to using the LineWelder, don’t get me wrong. You’d have to rely on power, so you’ll need to keep it charged if you want to use it. Obviously you’ll be buying replacement cartridges, especially when each cartridge can do about 12 welds. And, it’s one more thing you have to carry on you whereas your hands are already there. But, with the ease of use, predictable reliability, and advantages to using the LineWelder, I’d say it’s way more convenient. I really like the Tauten LineWelder. It does what it says it can do and does it well. It makes tying lures a thing of the past and does so without a lot of sacrifice. I wish I had an opportunity to test it on the water but from my judgment the weld itself will not spook fish away from your bait. It’s translucent enough to keep fish guessing. If you’re tired of tying your lines regularly, and you’d rather spend less time fighting a knot and more time fishing, take a hard look at the Tauten LineWelder. It gets the job done, does it well, and does it repeatedly with minimal effort. The days of struggling to pass tiny monofilament through various loops, holes and hook eyes are over when you get yourself a Tauten LineWelder. You won’t believe where this big bass was caught!